Excerpt from Dora Mahoes’ personal blog “A Story of Stories“. Dora was a Fall 2015 student from Biola University. Editor’s note: This post was originally published in February 2018 and has been lightly edited. It’s crazy to think that a little over two years ago, I studied abroad in Brisbane, Australia at the Australia Studies Centre (ASC). One of the biggest highlights was a class my fellow ASCers and I took called The View of Australia. 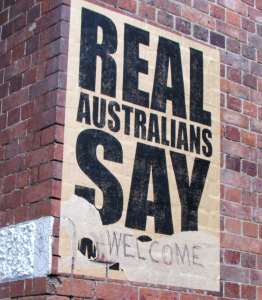 In class, we talked about Australia’s general perspective on different issues, and one that really caught my attention was Australia’s response to refugees. My eyes were opened to the reality that many countries (not just Australia), are afraid of welcoming refugees into their communities. Although this fear is understandable due to many terrible events that have occurred around the world, I wondered if it could also be the reason people ignore refugees and the challenges they face? After returning from Australia, I had many questions which led me to several research projects on the refugee issue. Through my research, I learned about catastrophic events such as 9/11 impacted how refugees are viewed. Refugees are often referred to as “dangerous,” “terrorists,” and “threats.” However, these negative labels and images often prevent people seeing the injustice and difficult circumstances refugees face during their time in camps, detention centers, and even in host countries. I was challenged to see that if left unchecked, fear prevents society from seeing refugees as people. People who had to escape war and conflict and seek to find safety in new communities. This verse highlights God’s vision for people in specific times and places with the hope that they will seek and know Him. When I read this verse, I realized believers have a choice to view the refugee issue as a missional opportunity. Although it is scary and overwhelming, God invites us to see how He redeems the horrible circumstances of millions of people to one which gives hope by giving them in new lives in countries like Australia or the United States. Countries where refugees can come into contact with the Gospel – some for the first time. God desires believers to participate with Him in redeeming the refugee crisis by loving and serving refugees who may not have had any meaningful relationships with Christians. Through these interactions, hope is found. A hope which may inspire refugees to seek God, reach out to Him, and find Him. Acts 17:26-27 challenged me so much that it led me to what I am pursuing today. By the end of the year, I hope to be part of a ministry team based in Phoenix, Arizona. The ministry is called GoTEN and they seek to make disciples among refugees by living in community with them, serving them, and sharing the Gospel. As I look at where I’m now, I can say my passion for refugees did not come in one moment, but instead it grew from the different choices I made. Who knew my decision to study abroad would lead me to Australia? Which led me to the ASC, which led me to learn about refugees, which led me to do some college papers on refugees, which finally led me to realize this was something I wanted to pursue after graduation. I sure didn’t! Two and a half years later, when I look back at what God has done in my life, I’m realizing He’s forming a pretty cool story, and it’s definitely far from over! Warning! This view is breathtaking. A view from Mt Warning. 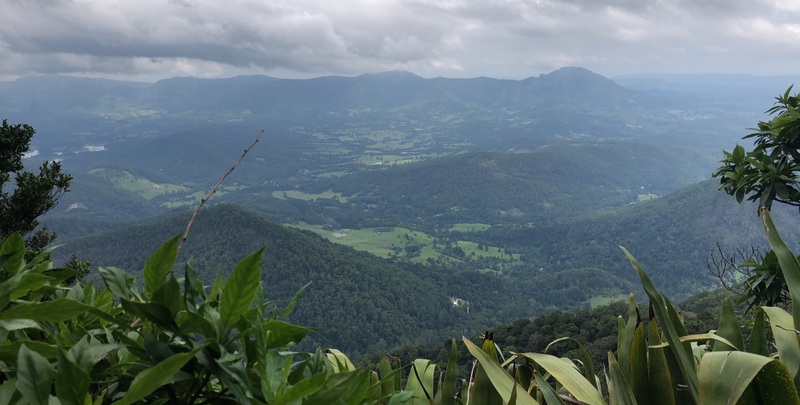 Current Spring 2018 students, Dalton Baker (John Brown University) along with Sierra Howard (Azusa Pacific University), Paige Allen (Biola University) and Hannah Herrold (Taylor University) attempt the 8.8 km (five hour return) hike through the rain-forest to the 360 degree view from the top! Enjoy the sights and sounds! Reproduced with permission. Excerpt from Jaclyn Holmes’ personal blog “Daughter of the Most High“. Jaclyn is a Spring 2018 student from Bethel College. Reproduced with permission. Even simple things have been teaching me about myself. Relying on the bus system to go to the mall or asking my host mom to take me to a friend’s birthday party have humbled me. You wouldn’t think riding a bus would teach you a life lesson, but for some reason, relying on someone else to get me where I need to go is making me realize just how independent I like to be. Back in the states I can just hop in my little Mercury Sable and go wherever I please. Here, I have to set my pride aside and ask for help (or chase down a bus). I have to tell myself it is okay to depend on others sometimes, and many times its necessary when you’re on the other side of the world. I became comfortable at college since I’ve been there for three years. I had my routine, friendships, classes, and professors that I knew like clockwork. I liked being independent and going where I please. I found comfort in the familiar. Now that I am in the unfamiliar, and I am known as “the American”, it is pushing me. I am essentially starting over. I think dependence and humility are going to become themes of my study abroad. Not only dependence on the people I meet here in Australia (and different ways of transportation), but dependence on God. Because as fiercely independent as I like to be, I need replace that with humility so my heart can be open to change. It may be difficult, but I think this season of change is much needed. If I want to be the woman that God calls me to be, I have to put His will above my own, and situate all parts of myself- heart, mind, & spirit- to be changed (even if there is some discomfort at the time). 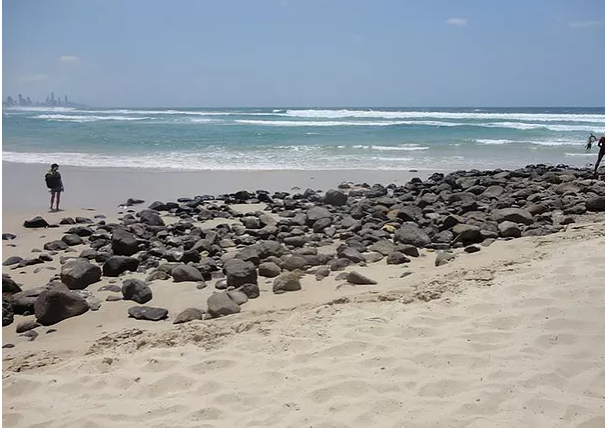 My time in Australia is going to be a wonderful experience and I am going to see some amazing things, but I would like it to be so much more than that. I’m hoping that I learn things about myself that I never knew before. 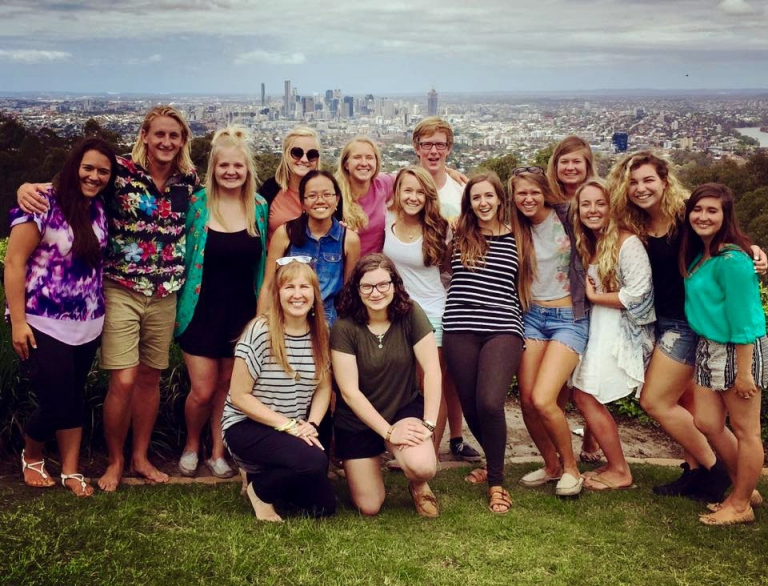 I also look forward to seeing God work in my relationships with the Australian students, host family, and in myself. This blog is written by Olivia Burkhart. Olivia is a Spring 2018 student from Grace College and Seminary. 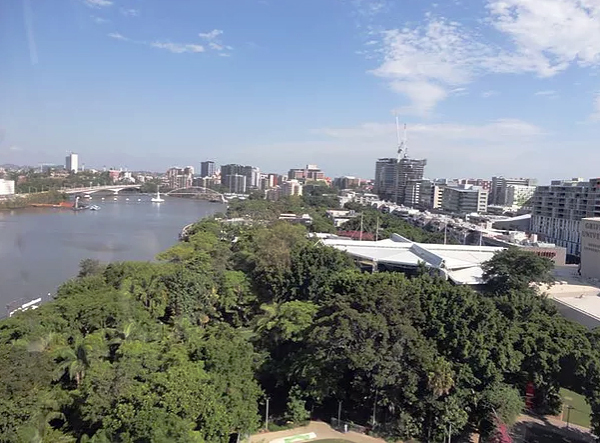 Arriving in Australia three weeks ago, ASC students have been settling in to their new homes that they will be staying in for the duration of the semester. As students have taken this time to get to know their host families, there have been many stories, both of awkward moments and joyous times shared among students. This prompted an eagerness for an opportunity for students to mingle with members of other students’ homestays. It just so happened that students would be able to participate in such an opportunity with their host families. At the start of the third weekend, the ASC organized a potluck dinner at the residence of one homestay family. Earlier in the day, the students took a trip to St. Helena Island for an interactive historical tour of the island as part of The View From Australia class. As this was an all-day trip, some students seized the opportunity to take a quick nap on the ride back home to ensure they had enough energy to last through the potluck party later that night. With the stereo system playing throwbacks, families started arriving with their student and finger-food in tote, the party was soon underway. The night was filled with yummy food and fellowship, as students and families were able to mingle with each other. A photo booth was also set up so that families and students could create lasting memories of their semester together. 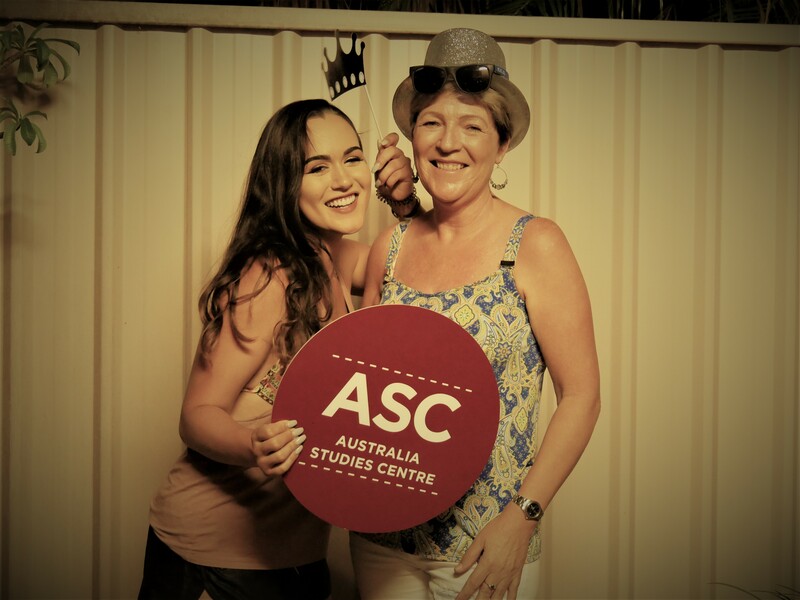 ASC student Maleya striking a pose with her host mum Susan! Once people had enough to eat, a game was played in order to test how well families knew their student and vice versa. This proved to be an entertaining bonding experience between students and families as they were able to learn more about one another. The night ended with students going for a refreshing swim in the pool whilst parents continued to socialize among themselves. All in all, the potluck dinner was a success, it fostered new friendships and strengthened connections between students and families.